UPPAbaby Cruz is a lightweight stroller with reversible seat. The Cruz model is little sister of a Vista since it is lighter and more compact. It’s designed for on-the-go parents who live in an urban environment. You can take it to the store, shopping mall or doctor’s office. It has small wheels and narrow frame that makes it very easy to navigate store aisles and tackle tough sidewalks. It is NOT your all-terrain regular stroller. You will have a hard time taking it to the park to walk a trail. It is not designed for going over grass, gravel or mulch. Cruz is somewhere in between the umbrella stroller and your regular stroller. The wheels are too small for a regular stroller and at the same time, it is too heavy (22 lbs) to be an umbrella stroller. Usually parents have two stroller: a heavier all-terrain stroller that you can take to the park or for a stroll around the neighborhood, and a lighter one that you would take to the mall, doctor’s office or on the plane. For parents who want to save money by buying only one stroller, Cruz is a great choice. It will definitely get you through the first 3 years. The roomy seat can accommodate a child from birth and up to 50 lbs. You can also convert it into a travel system by getting an infant car seat adapter. -Great canopy. It is not a large canopy, but it has a hidden SPF 50 extension visor that pops out and provides a full sun coverage. It has a large peekaboo window with a magnetic closure (love it!). Now, you can quietly peek at your baby without waking him up with that noisy Velcro. The peekaboo window is a dark mesh that provides some shade and also creates better air circulation on a hot summer day. Another cool thing about Cruz is that you can switch the colors by changing the material (sold separately) of the seat and canopy! -Adjustable handle bar. It is a telescoping handle bar that can be easily adjusted by pressing a button in the middle of the handle bar and pulling it out. It extends from 39.5″ up to 42″ from the ground. Great for shorter and taller parents. -Roomy seat. It has roomy padded seat that can hold a child from birth and up to 50 lbs. The seat is 12″ wide and 22″ high from the bottom of the seat to the top of the canopy. If you have a taller child, you can slide the canopy up to get 2″ more inches. It has one-hand lever recline that has 5 positions and goes all the way down to a flat position. It’s suitable for newborn, but Uppababy recommends getting an insert for better support. Because the seat is one molded piece, it keeps its ‘V’ shape when you recline it. I absolutely love how upright seat is! A lot of kids, like my daughter Sophia, hate to be reclined and want to sit upright with unobstructed view. Sophia likes to look around and feel in charge. The seat material is easily removable and can be machine washed! -Reversible seat. The seat is reversible. All you need to do is push two buttons on both of the sides of the seat, swing the seat around, and lock it in. And that’s it! Now, your child is facing you. You can still recline the seat all the way even when it’s reversed, but you have to switch it back in order to fold the stroller. -5 point harness. It has adjustable padded 5 point harness with a center release button. The button is very easy to unlock (your 2 year-old will be able to escape). -Adjustable foot rest. The are two foot rests: one is part of the seat for smaller babies and another one is a part of the frame for older children. The seat leg rest is 10″ high and is adjustable. The frame foot rest is not adjustable. I think because of the seat leg rest, some parents might think that this stroller is designed for younger children. The first time I looked at it, I didn’t realize that there is also a frame foot rest. I only figured it out after I’ve done some research and watched review videos. The leg rest has two positions: up and down. -Large basket. I LOVE this basket! It’s large and easily accessible from all sides. You can even access it form the front. It will fit your large diaper back and then some. -Wheels. The Cruz has 4 single rubber wheels with 6.5″ wheels in the front and 7.5″ wheels in the back. The front wheels are swivel and can be locked in place for more stability. -All-wheel suspension. Although the wheels on Cruz are small, the all-wheel suspension helps to absorb some of the bumps providing your child with a smooth ride (on almost a flat surface). If the terrain gets tougher than a regular pavement, it will be a bumpy ride. -Parking brake. The is a one-step parking brake located in between rear wheels. It is a flip-flop friendly pedal that is easy to lock and unlock without scratching your shoes (God knows how many shoes got ruined because of those unfriendly brakes). -Easy fold. It’s a two-hand two-step fold. First, make sure the seat is facing forward and is in upright position. Next, pull two levers located on both sides of the handle bar and fold the stroller in half. That’s it! You can also take the seat off before folding. It does have an automatic lock and it does stand on its own when folded. Cruz is not very compact stroller with folded dimensions of 22.25”W x 11”L x 37”H (with the seat attached). -Easy to clean. The canopy and the seat material is easily removable and machine washable. You can also purchase additional colors of the seat and the canopy in case you changed your mind and want to have other colors for your stroller. How cool is that? -Weight. At 22 lbs, Cuz is too heavy to be a lightweight stroller. At the same time, because of the small wheels, it is not your regular all-terrain stroller. -Bulky. It’s not a compact stroller when folded mainly because of the one-piece seat. Most lightweight strollers have a very compact fold and are great for traveling. -Lack of storage. Besides the large basket underneath (that I really like), there are no pockets for small items. Many strollers have a pocket in the back of the seat or a small zipper pocket on the back of the canopy for small items like keys, cell phone, and wallet. Not on Cruz! -Telescoping handle. Some parents complaints about the telescoping handle adjustment button not working properly, but I think this problem has been fixed. So it is not an issue anymore, but I still wanted to mention it. -No bumper bar. When I spend $460 on a stroller, I do expect to have at least a bumper bar. I can’t believe it has to be purchased separately. Baby Gizmo has a great video review of Cruz. Note: The seat is 12″ wide and not 13″ like they said in the video. Overall, Vista (V) is more expensive stroller with bigger wheels, more storage and better suspension. It comes with a bassinet and a bumper bar unlike Cruz (C). The Cruz is more compact and lighter with smaller wheels and more narrow frame. -The price. The C is sold for about $460 vs V that costs around $730. -No bassinet. C doesn’t have a bassinet included like V. But you can purchase it separately for around $190. -No bumper bar. While V has an included bumper, for C you will need t purchase it separately. -Narrow frame. C is more narrow at 22″ wide vs V that is 25″. -Smaller wheels. V has 8″ front 11″ rear wheels vs C that has 6″ front 7½” rear wheels. -Less storage. The basket on the C is smaller and there is no zipper pocket behind the seat like on V.
-Weight. V weighs 25.5 lbs vs C that weighs only 22 lbs. For 2013 UPPAbaby Cruz is available in five colors: red, gray and yellow, gray and light blue, gray and purple, and black. All of the strollers have a silver frame. 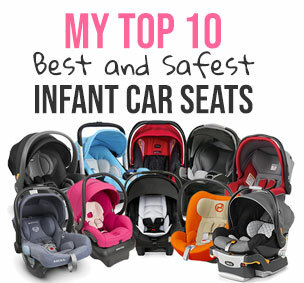 I usually include a link to a comparison chart, but unfortunately, I was unable to find one for UPPAbaby. I will put one together when I have time. Accessories for Cruz include snack tray ($40), piggy back/glider board ($90), bumper bar ($25), infant snug seat insert ($31), parent organizer ($18), cup holder ($23), travel bag ($90), footmuff ($50), and bassinet ($190). It also has car seat adapters specifically made for each different brand of car seats. The only thing I don’t understand, is where is the rain cover? There is a rain cover for the bassinet, but not the stroller. Love everything about this stroller, EXCEPT the WHEELS are terrible quality, as is Uppababy customer service!! I’ve had this stroller for the past 2 years and change. Great large canopy, large storage, and it maneuvers beautifully. I live downtown in a large city and needed a stroller that didn’t take up much space on sidewalks and in shops, cafes, etc. So in this way it has served me really well! Plus you get a rain cover and bug net. I spent extra cash (probably about $200!) to make my daily usage more enjoyable, such as a cup holder, snack tray, bar, car seat adaptor. And my growing loyalty to the brand even had me order the Uppababy G-lite umbrella stroller without even shopping around because I trusted their quality so much!! Uppababy Cruz clearly has to fix this wheel quality issue. My current wheels are completely wrecked, and suddenly I am getting snubbed by customer service who will not send me any more. They have been claiming for FOUR MONTHS that their wheels are “out of stock” and will send me a pair immediately. How about, stop lying or reimburse me for my troubles!! Now all the rubber of the rear wheels is falling apart. This is NOT a warranty issue, rather a poor quality that needs to be dealt with before more people cluelessly spend close to $1000 on the stroller plus accessories!!! I’ve actually been having the same problem with my uppababy cruz. I received a set of back wheels in August of 2014 and the rubber has split down the middle already and it hasn’t even been a year. I ordered another set of back wheels from them ($50) and I’m hoping this set will last.